Does your property suffer from sewage odours or occasional foul smells? Locating the source of a bad smell within a plumbing system can prove to be a time consuming and costly exercise. Fortunately, drain smoke tests are a useful tool to accurately detect any vulnerability within the sewer system. 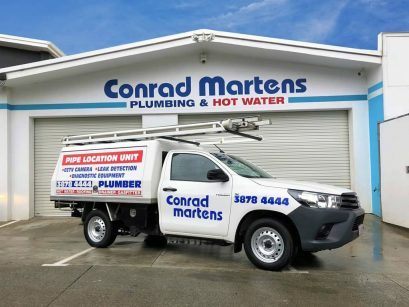 Conrad Martens Plumbing & Hot Water provide a comprehensive drain service to Brisbane including plumbing smoke testing and CCTV camera inspections. A drain smoke test is conducted by releasing a non-toxic smoke into a sanitary sewer system. Smoke testing sewer lines essentially transforms the pipe systems into a chimney. As the smoke rises, it escapes through any cracks or breaks in the pipework revealing the source of the smell. Depending on the scope and severity of the issue, this can be achieved via smoke bombs or a commercial smoke blower. Conrad Martens Plumbing has conducted a number of successful smoke tests on large commercial buildings in Brisbane’s CBD. For smaller applications, our drainage specialist can also employ a range of other techniques to identify and eliminate odours. Sewer odours are often the result of defects within a plumbing system. The usual suspects include dry traps, breaks in pipework and blockages. More serious issues can result from illegal connections, unfinished pipework and missing manhole covers. As these faults are often concealed, a plumbing smoke test is an excellent, non-evasive, means of identifying the problem. For the best price, service and advice. Following a successful drain smoke test, a quick assessment with the CCTV pipe camera can reveal a clean plan of action. Our Brisbane plumbing smoke test specialists are experienced in repairing faults within sanitary plumbing systems. Broken or disconnected pipework can be rectified by pipe lining or the replacing the section of sewer pipework. Dry floor wastes can be remedied with the use of a Grate Mate. By installing an upstream fixture, dry traps can be ‘charged’ to prevent any bad smells from escaping into the building. On completion of the installation of a new drainage system in Brisbane it is mandatory to conduct a pressure test. Using a test plug and compressed air, this test is used to detect any sight pressure drops within the system. Over time, however, the plumbing system can deteriorate which can result in sewer gases escaping into a building. 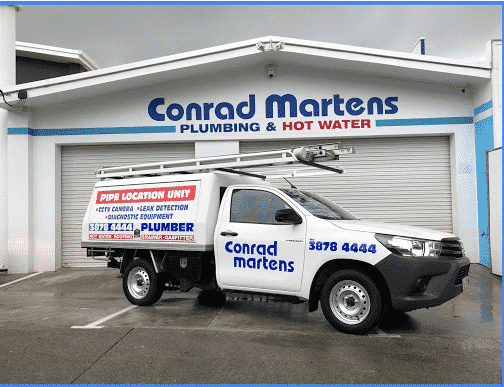 Conrad Martens Plumbing & Hot Water has had a long history servicing Brisbane and the Greater Brisbane area. We provide a professional drain smoke testing service that delivers results. If your home or business suffers from sewer odours, contact our friendly office on 3878 4444.